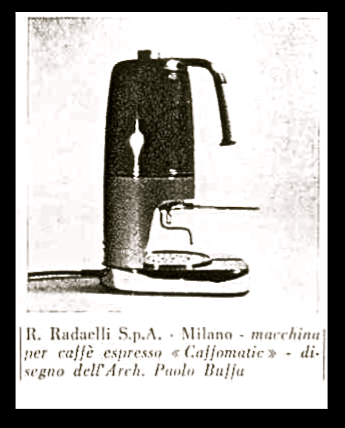 On June 3, 1953, Enrico Radaelli patented a new, original and ornamental design for a coffee maker, designed by famous architect Paolo Buffa. 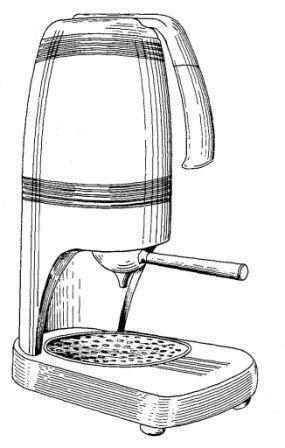 The patent covers only the exterior of the machine, no mention is made of the mechanism of operation, which is derived without change from the Gaggia Gilda "first model" . The machine is called "Caffomatic" and wonder for a few practical solutions, such as sight glass level indicator, located on the side. Was produced in the period 1953-1958. Is it quite rare. © 2011-2013 Francesco Ceccarelli. All rights reserved.